Christopher was quite the trooper being in the hospital bed for five days on an epidural with the CPM machine running 24/7. He didn’t get out of bed for 5 1/2 days! That’s a tall order. They ordered him a specialized air bed so he wouldn’t experience any bed sores. I cannot say enough about the medical staff at St. Mary’s. They are top-notch. His brace fitting was seamless, they delivered our prescriptions and I have a copy of his x-rays on disc. They have it together here. For Christopher’s epidural removal, the awesome Child Life staff kept him distracted. 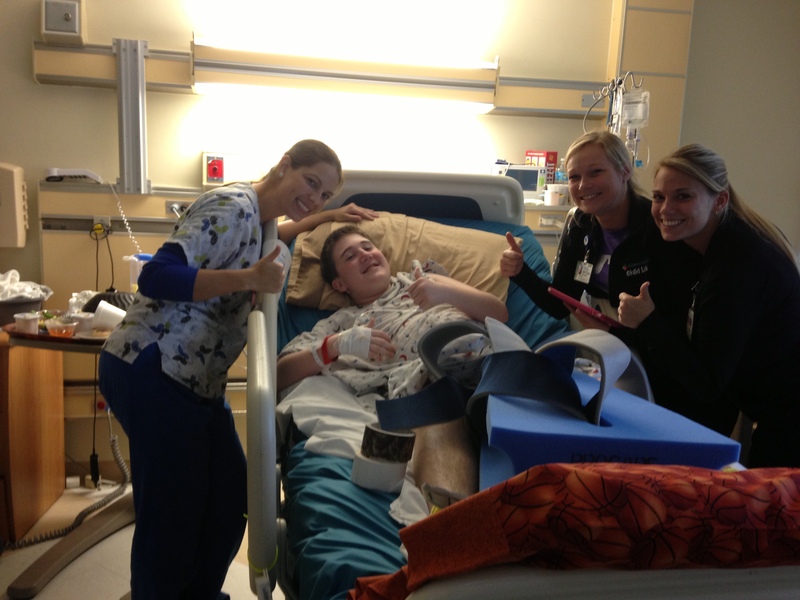 We had the best nurse EVER. Her name is Elissa and we just LOVE her! He will be discharged on day nine. He would have released today but his pain management wasn’t quite right. We have it straightened out now. The early mornings are his worst time. Neither one of us sleep during the hours of 1 – 4am. I may sleep for days once we officially break out. We’ll see Dr. Paley in the morning for grand rounds and start physical therapy tomorrow. Dr. Paley wants us to stay six weeks for physical therapy and to keep an eye on Christopher. He said he could always put on an external fixator so I’m not sure we have completely escaped it yet. We met a new family while in West Palm Beach that lives in Houston. 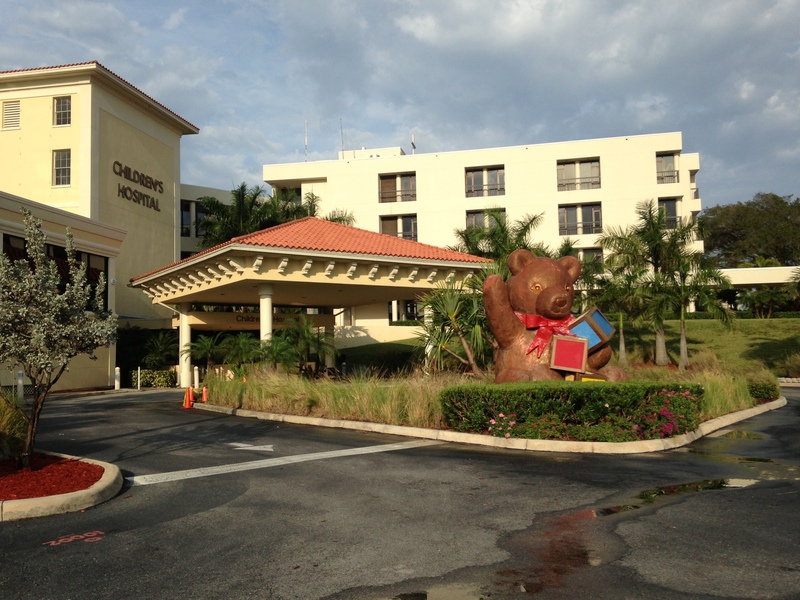 Gracie has been a Paley patient since she was a baby and used to go to Baltimore and followed him to West Palm Beach. She was the last surgery of the day and was right after Christopher at 9pm at night. CRAZY! Think we met them by consequence, I think not! 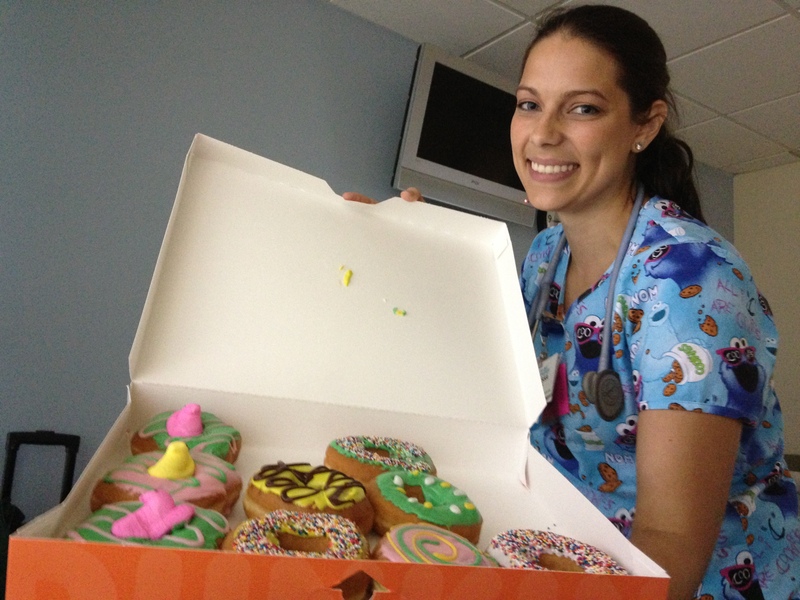 Our awesome nurse, Elissa, brought Christopher and Gracie donuts for breakfast. Everyone was waiting on Christopher to wake up because he slept in from being up all morning. 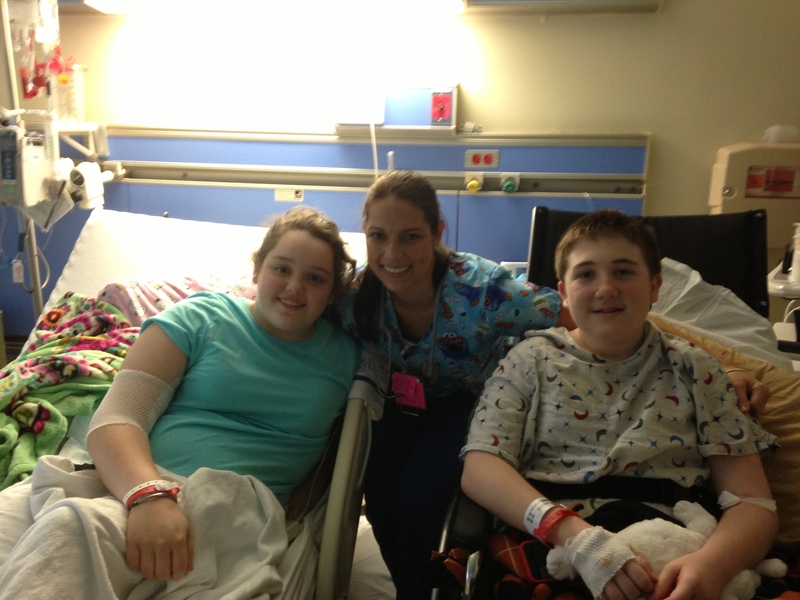 Elissa and Christopher created a special bond. She kept telling Christopher he was too polite and she said, ‘next time I see you, I want you to be mean.’ He threw a washcloth at her face the next time she walked in the room, which took her by surprise, then mustard packets, mayo, salt. Even the other nurses gave him ammunition. It made the days go by faster. This entry was posted in Hip Surgery #8, Perthes, Post-Op and tagged CPM Machine, Dr. Dror Paley, Dr. Paley, Legg-Calve Perthes Disease, Legg-Calve-Perthes, Paley Institute, Perthes, Physical Therapy, Pool Therapy, Post-Op, reshaping osteotomy, surgery, West Palm Beach, wheelchair, X-rays. Bookmark the permalink.